Hello all and welcome back to What I Am Reading. I know it has been quite the long interlude between posts and I hope all of you have been well. 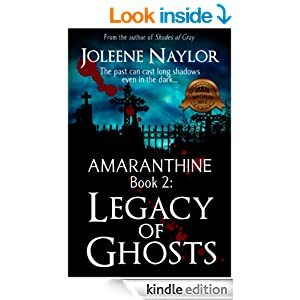 This time around I am featuring book 2 in the Amaranthine Series by Joleene Naylor. I had previously reviewed book one last year and followed up in the same year with Vampire Morsels and 101 Tips For Traveling With A Vampire. All of these titles are by Ms. Naylor and there are many more to choose from! If you have not already read my reviews of the above mentioned titles, please search through the back issues of What I Am Reading to check them out. Legacy of Ghosts picks up where book 1 leaves off. The protagonists, Katelina and Jorick, have survived a bloody conflict and, despite the pleadings of Oren to join his war against the guild, have opted to recover at Jorick's seaside home. Initially, this second volume focuses on some further character development between Jorick and Katelina, offering the reader a glimpse into the raven haired vampire's past as discovered by Katelina when snooping through some love letters from over a century ago. However, the story soon gets 'vamped up' a notch as Katelina finds herself in a perilous situation and nearly at her life's last breath. Jorick's solution to saving Katelina enriches the story with an insight into the writer's own style of vampire lore. When our heroes discover who is behind the attempt on Katelina's life, they once again join forces with Oren and his motley band of renegade vampires. Legacy of Ghosts is a riveting sequel in an exciting series. Joleene Naylor draws the reader into her dark and terrifying world through the eyes of a mortal, making one often feel as helpless as she as her grim reality takes her further from the 'normal' world we are familiar with and deeper into an underbelly of a society that perpetuates in the shadows. Sounds a good book with some real depth to it. Thanks 4-LAN for the review. Will tweet, too. Riveting review as well! tweeted it!